To say Hurley represents an innocence and optimism on the island is an understatement. Throughout the entire series, he acted as the harbinger of fun and a lightheartedness that was sometimes desperately needed in the darkness that was the island. 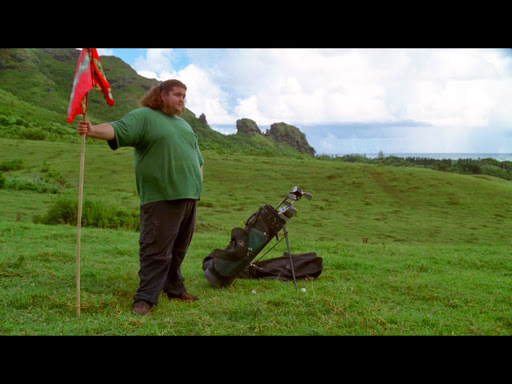 This scene here is Hurley building a golf course for the survivors. While everyone else was busy worrying about rescue, and building shelter, and the hopelessness of it all, Hurley knew that all they needed was a small distraction. Something fun to remind them what it means to be alive. Ridiculed at first, soon he has the entire batch of survivors watching as our main cast go head to head in Island Golf. What could have easily been a character purely existing for comic relief, Hurley becomes the heart of the island. One last thought - spoiler, the van episode is my favorite throw away episode.